'BirthWrong' offers a trip to Spain to show Jews they don't need Israel to be safe, ignoring the oppression of Spanish Jews for centuries. Max Blumenthal and Jewdas, a London-based Jewish anarchist group, have launched a "BirthWrong" program, in opposition to Birthright. 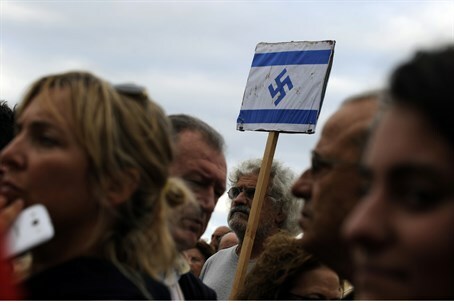 The first BirthWrong trip took place this month, taking participants to Spain in an effort to convince them that Jews don't need Israel in order to be safe in the world. Blumenthal is an American Jewish journalist who is best known for his anti-Israel writing, including a book equating Israel with Nazi Germany. Two years ago, the Simon Weisenthal Center put him at ninth place in their list of the year's worst anti-Israel and anti-Semitic slurs. Blumenthal acknowledged the recognition with pride. Blumenthal published several articles about BirthWrong on the website Mondoweiss. Like the journalist, Mondoweiss is frequently accused of promoting anti-Semitism, disguised as a pro-Palestinian narrative. In his first article, Blumenthal described his interest in the trip by saying that, "Not only did it offer a potential escape hatch from Zionism, it presented a real alternative by re-centering Jewish identity around a vibrant diaspora tradition." The choice of locations is ironic. While it is true that Jews have a long history in Spain, the "vibrant diaspora tradition" largely ended in 1492, when the king and queen ordered all the Jews in Spain to either convert or be exiled. Even those that converted were not safe. Many who did so were later tortured and killed by the Inquisition, on suspicion that they did not truly believe in Christianity. Surprisingly, BirthWrong guides and organizers did acknowledge the historical oppression of Jews in Spain. The group toured the ghetto in Seville and discussed the life of Maimonides, whose family was among those kicked out of Spain. It does not seem that they drew any connection between powerless Jews being oppressed for centuries in Spain and the importance of a Jewish state, though. Instead, they tried to argue that, no matter how bad Jews were treated in Spain, Muslims were treated worse. The program then built on that assumption to imply that Spain's actions in the 15th century make modern Israel and its efforts to defend itself illegitimate. As Blumenthal described learning about Maimonides, arguably the most revered rabbi of the past two thousand years: "Our local guide’s repeated emphasis on the Arab heritage of Maimonides reminded us how the culture he represented was first destroyed by the Inquisition, then erased by the Eurocentric ideology that positioned Jews and Arabs (and by extension, Muslims) as implacable enemies requiring of separation. Today, the idea of an Arab Jew is seen as ridiculous except within the circles of radical Mizrahim trying to recover their identity from the ravages of Zionism." While visiting Seville, the group discussed a new Spanish law, which offers citizenship to the descendants of Jews kicked out in 1492. Despite the fact that Spain is an entirely separate country from Israel, located on a different continent, Blumenthal did not miss an opportunity to attack Israel. "Unfortunately, Muslims are not eligible. Many Arab Muslim families, especially in North Africa, trace their ancestry directly to Spain – for instance some members of my friend Ali Abunimah’s family say their ancestors came to Palestine from Spain in 1492." This last admission is striking. Abunimah is one of the fiercest anti-Israel critics in America. He regularly insists that Palestinians are the indigenous inhabitants of Israel, and the Jewish Israelis are foreign interlopers. According to Blumenthal, though, Abunimah's own family is not native to the Middle East.